I love Basil. Which is why I have untamed Basil bushes growing in my lawn. 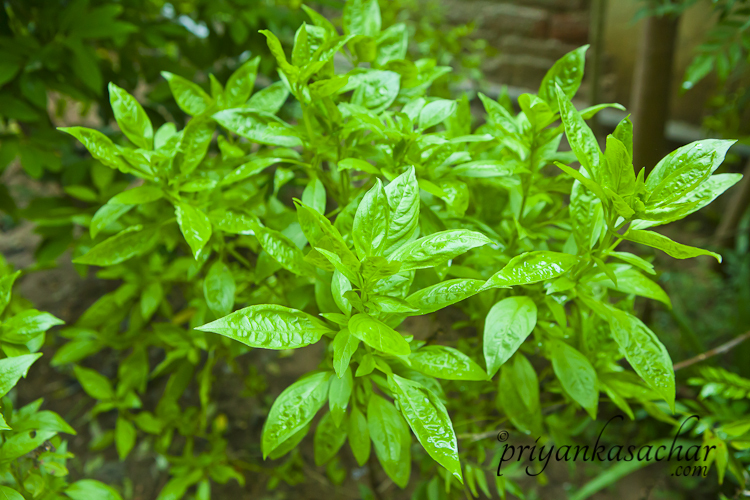 It’s a cousin of our very own Holy Basil (Tulsi) but tastes very different. 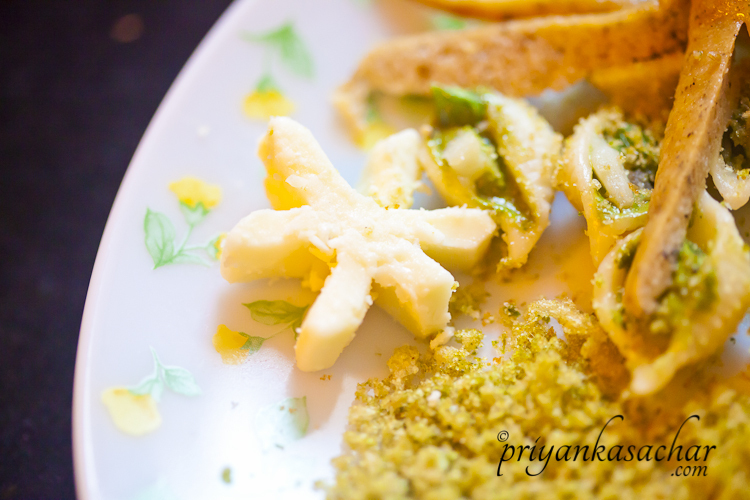 Apart from garnishing anything with basil, the best thing to make with it is Basil pesto. 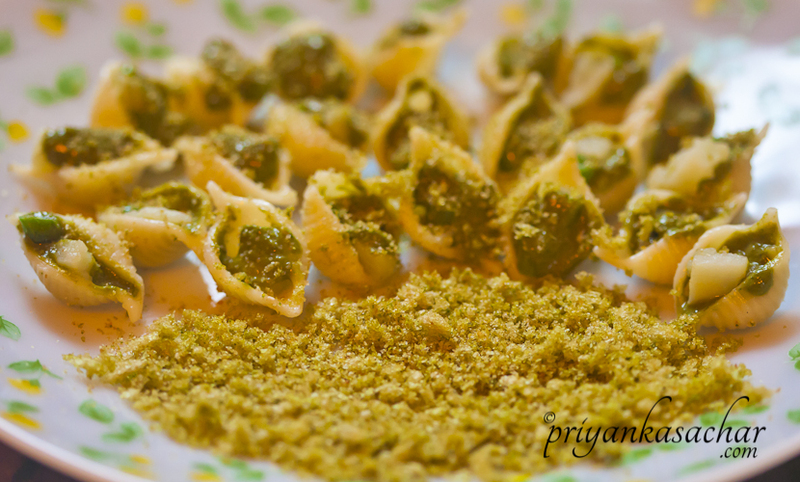 Pesto is a sauce originating in Genoa in northern Italy and traditionally consists of crushed garlic, basil, pine nuts blended with olive oil, and Parmesan cheese. There are many variations to this. 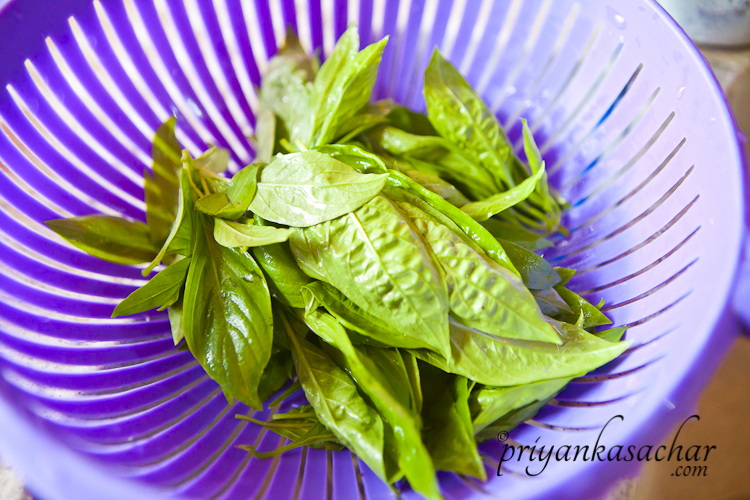 You can add a dash of other herbs that go with basil or replace pine nuts with walnuts or even almonds. You can also make it without any nuts and it’ll taste really good even then. The word pesto comes from the past participle of the Genoese word pestâ which means to pound, to crush, in reference to the original method of preparation, with marble mortar and wooden pestle. Anyway, enough with the history behind it. 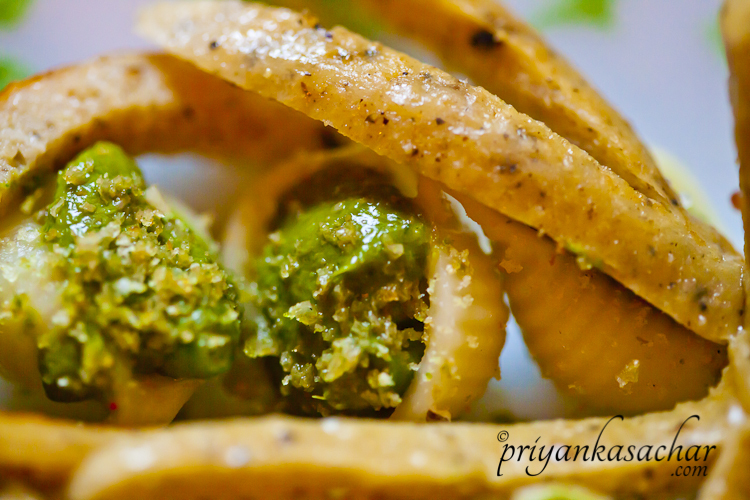 Pesto tastes wonderful and is typically used in Italian pasta recipes. A very classic Italian recipe is Genovese pasta, that originated in Genoa, where potatoes and long French beans are added to pasta and then tossed with generous amounts of basil pesto. 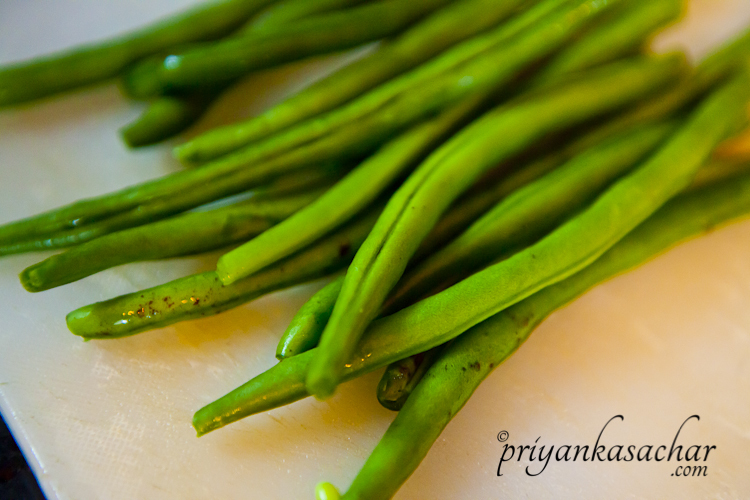 It’s very quick and easy to make and is made with veggies like potatoes and beans which are staple to all households! I’ve made it earlier as well, as shown in the instagram image below. 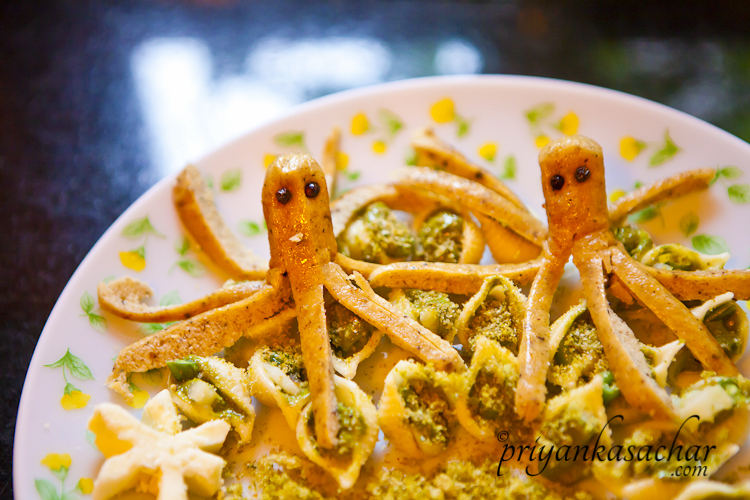 So on this fine sunday I decided to give the Classic Genovese pasta – a twist. 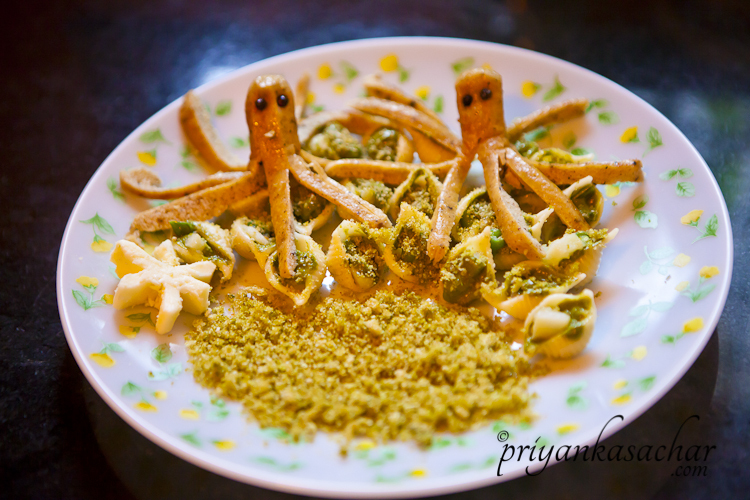 Instead of the pesto and the veggies being on the outside of the pasta, I decided to put them INSIDE the pasta. Hence the Inside Out Genovese Pasta. (The twist to this recipe doesn’t end just there). 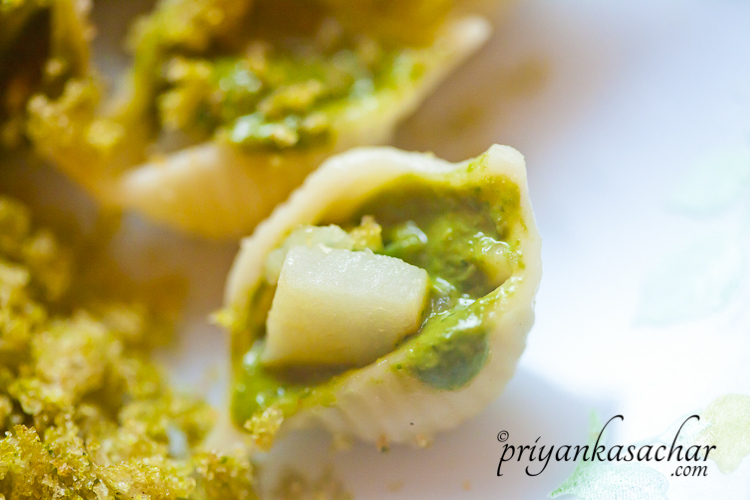 I figured that the best shape for this dish, which is easily available in India would be Conchiglie (Sea shell shape). 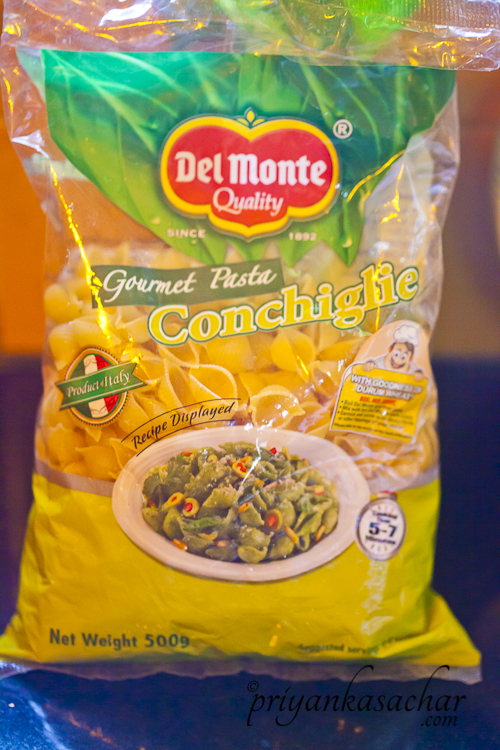 So off I went to the local gourmet store and bought myself a pack of Del monte’s conchiglie pasta. It’s a good pasta for stuffing things as well as eating like regular pasta. It also coats well and holds shape. And since creating food is akin to creating art, I decided to play out a seaside scene with my food, sitting far away from any beach and sans any seafood. Hence came into existence – the ‘Inside Out Genovese Pasta At The Beach’. So here are the detailed steps. Utensils/Equipment – 1 large pot or saucepan for boiling, 1 pan for sauteing, 1 mixer/blender/grinder, 1 toaster or oven or air fryer, 1 peeler for peeling, knife for chopping, colander to drain veggies and pasta, 1 cutting board, 1 cookie cutter with a star shape, 1 dish for plating. 1. In a large pot or saucepan, put water to boil. Add some salt. Put the Conchiglie shells in it and cook al dente or as per what you like (I like them properly cooked). Drain them , Pour a dash of extra virgin olive oil on them and keep aside. Ideally the pasta and the potatoes and the beans can all be cooked together in one pan but in this version of the Genovese pasta, since we’ll be stuffing the shells, it is important to cook the pasta and the veggies separately. 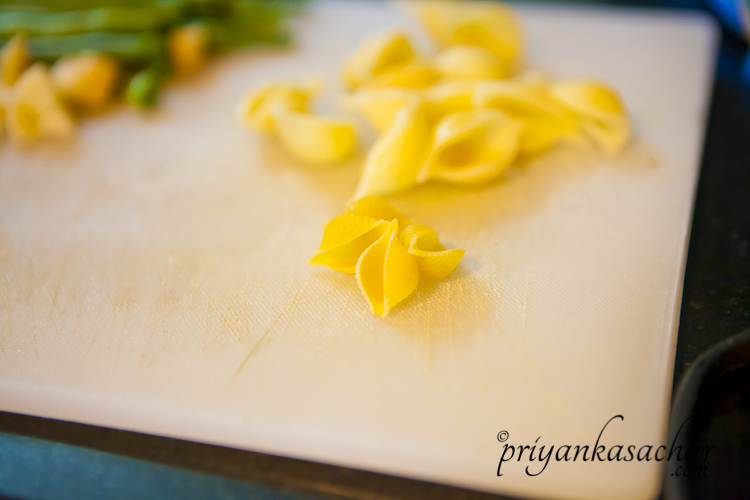 This image shows the uncooked pasta with the cooked pasta in the background to give an idea about the relative size. 2. For Basil pesto, in a blender blend the nuts with the garlic and parmesan. Then add the basil, dash of balsamic vinegar, extra virgin olive oil (as per your health concerns) & churn into a sauce. Season with salt and a little pepper. Put aside. Even if you make extra you can use it later, as a dip or just as a spread in a sandwich. 3. Peel the potatoes, and then dice into very small half inch cubes. The size should fit into a piece of pasta. 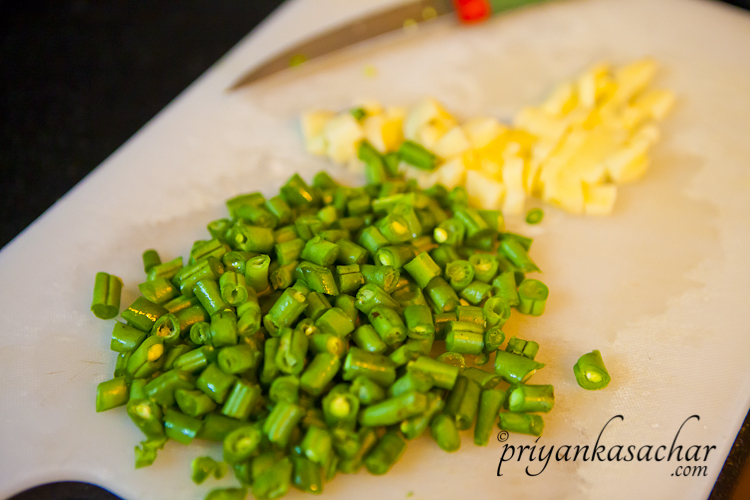 Take the trimmed beans and similarly, chop them into half inch pieces. Classically in a Genovese pasta , the beans are barely halved in size and sometimes not even halved. Readers can try that version as well. It would just mean not stuffing the shells. 4. Again take some water in the earlier pot or saucepan, add some salt and put to boil. Put the potatoes first, since they’ll take longer to cook and we want crunchy beans. After 5 minutes, add the chopped beans. Cook for 2–3 minutes until the beans are cooked but are still crunchy. The potatoes should be cooked thoroughly. Since they have been diced into small cubes, it will not take that long. Drain both veggies in a colander. 5. Take a pan, heat up some olive oil in it and add a generous pinch of thyme. To this now add the potatoes and the beans. Toss quickly and add some salt and pepper. 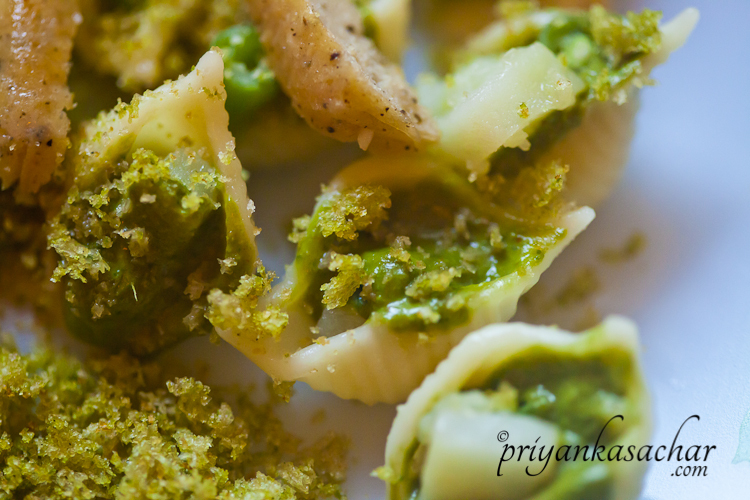 Keep in mind that there is already salt in the pesto as well as the Conchiglie pasta. Keep the mixture aside. 6. In a pan, heat up 1 or 2 hot dogs or frankfurters or sausages. Whatever is available and as per your appetite. I used chicken pepper sausages in this example. 7. Take a dish in which you wish to do the plating. 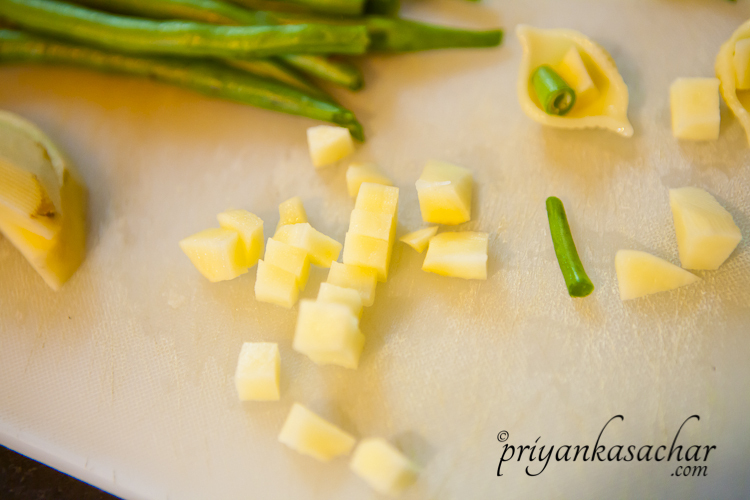 Take one shell at a time and put a piece of bean and a cube of potato or just few pieces of one vegetable as per your choice. There’s no set formula, and it can be a random mix as well. 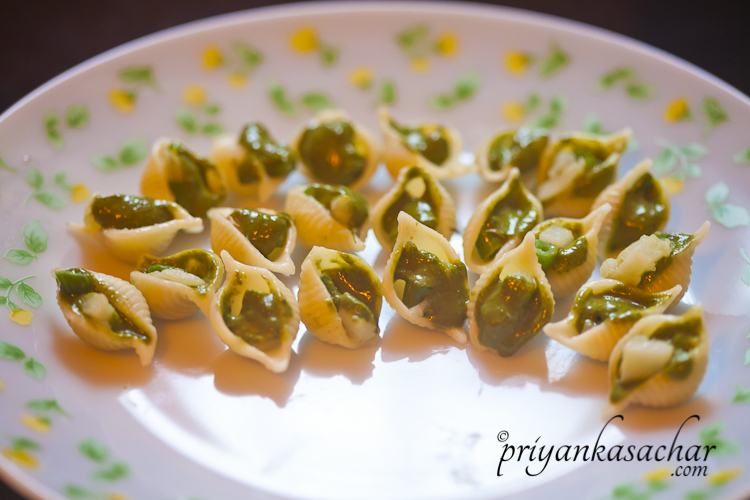 After this you have to put the basil pesto inside the shells. You can either use a small spoon or use a piping bag or icing gun if you are more comfortable with that. I used a small spoon. You can also choose to put the pesto first and veggies later. It can be an interesting mix of stuffed shells. These will, as is apparent, be the sea shells in your beach scene. You can stuff as many shells as you want. The quantity in the image below is only for representation of the beach scene. 8. 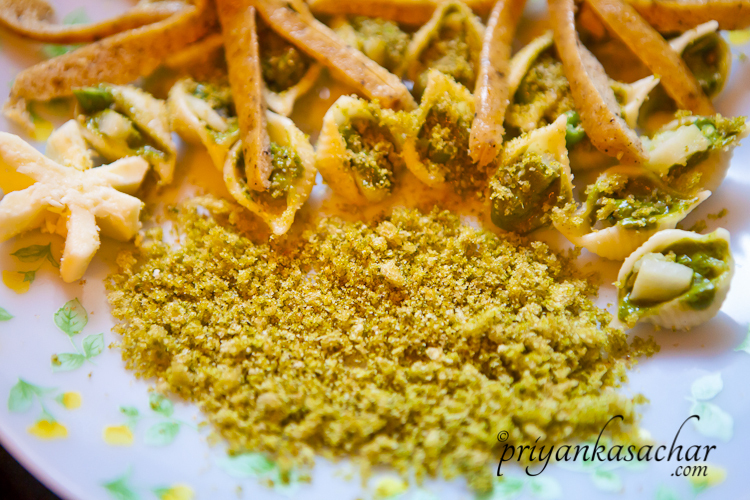 After you have taken several shells (as per your appetite) and stuffed them, and aligned them on a plate, take a slice of bread and spread some basil pesto on one side. Toast in a toaster or bake this bread till it is brown and crisped completely. I used the air fryer here for the same result. Once this is done, break the crisped toast into pieces and crush into powder in a blender. This will be the (flavoured) sand at the beach. Pour the sand in one corner of your seaside scene. 9. Take the cheese block and a cookie cutter in a star shape and cut out a star piece. After this you can try your artistic skills and slice off more cheese to make this star look more like a starfish with slender tentacles. You can place this starfish anywhere in the seaside scene. 10. Take the cooked sausages (or hot dogs) and after leaving 1 – 1.5 inches on the top, slit the rest into 2. Then slit into 2 more. Then slit the individual 4 pieces into 2 each. 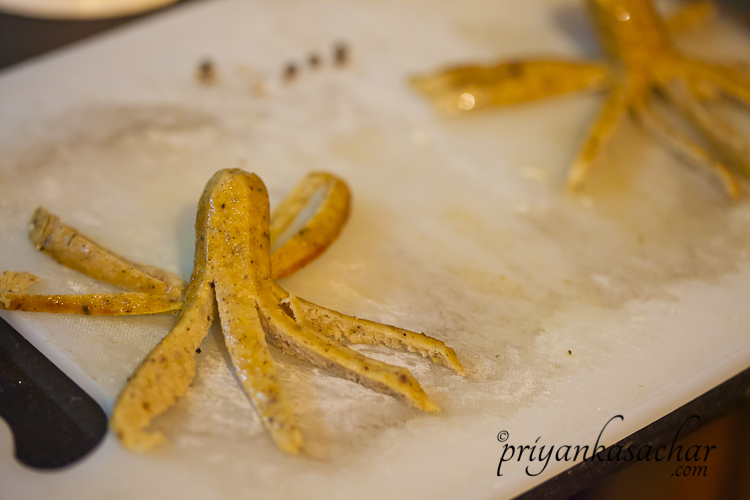 The resultant 8 pieces will be the legs of the octopus. Stick 2 peppercorns into the top portion of each sausage to make eyes. You might have to poke a tiny hole with a knife if they don’t stick in. Your octopuses are ready! Place the octopuses anywhere on the seaside scene we have going. 11. 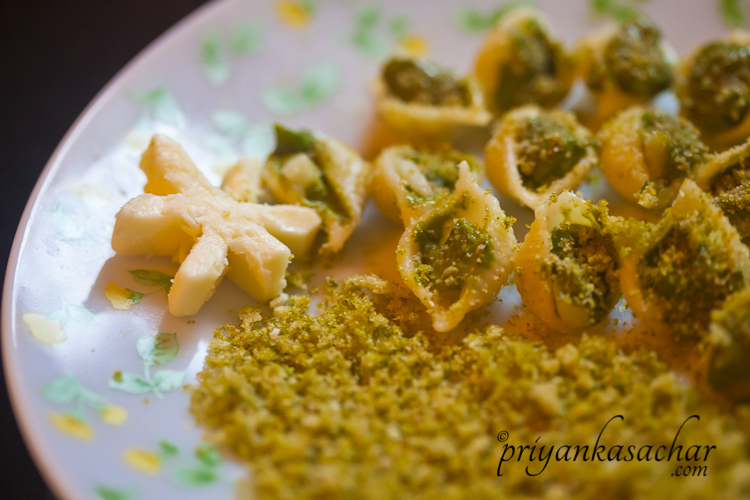 For the final touch, You can also sprinkle some of the pesto toast sand onto the shells. Your sea beach scene is complete! If you wish, you can splash a little extra virgin olive oil in this dish too. Instead of serving bread on the side as is typical with pasta dishes, I’ve used the bread as sand. 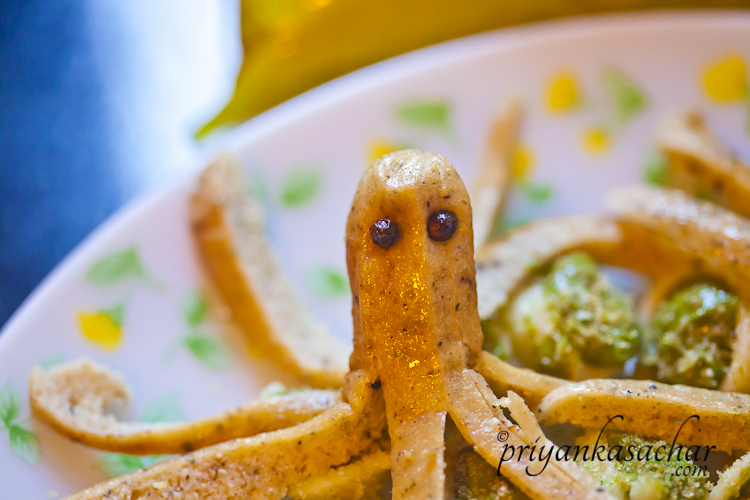 Instead of adding chicken to the dish while cooking, I’ve used chicken sausages for octopus. You can also omit the sausages if you are a vegetarian. All in all, this is a healthy wholesome meal made with commonly available ingredients. 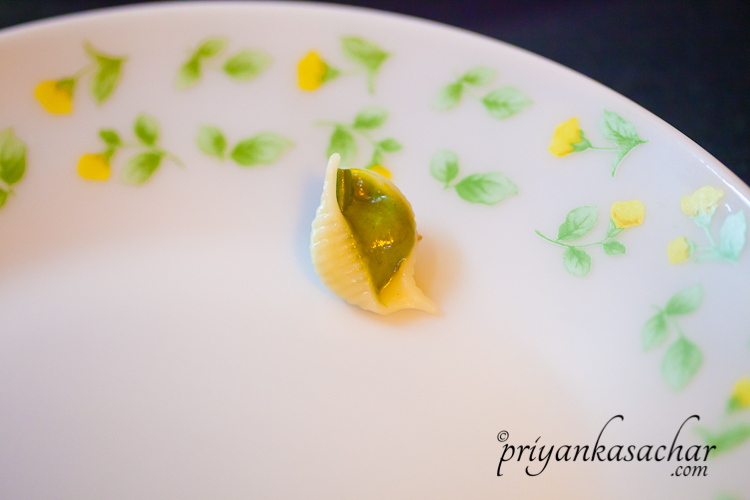 Here are some closeups of individual elements of this dish. 1. You can also leave the plating portion of this recipe and just toss the pasta together with the potatoes and beans and basil pesto. 2. For a variation, you can also add a dash of vodka into the pesto instead of balsamic vinegar. 3. Leftover pesto sauce can be stored in a jar. 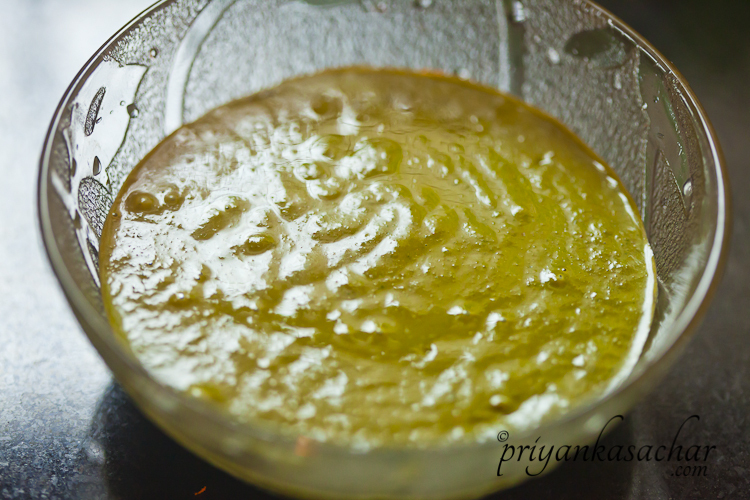 Add some extra virgin olive oil on the top to avoid oxidation. 4. Leftover pasta can be put in muffin cups, layered with grated cheese on top & baked. A quick to-go handy bite is ready!